Furnstyl is gearing up to celebrate Chaitra Navratri 2018. Navratri is a Hindu festival that is dedicated to the worship of Goddess Durga and her nine avatars for a period of nine days. This year Chaitra Navratri would begin from 18th March and go on till 25th March. Chaitra Navratri is celebrated in the Hindu month of Chaitra. We celebrate our Navratra and provide you UPTO 50% off+9% off on all our Furniture** from 18th March and go on till 25th March. You will find a wide range of Luxury Furniture on this festive off and give a complete makeover to your living, Dining and Bedroom. 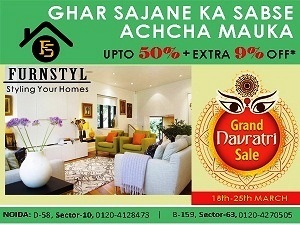 You also grab our offer on our Showroom on Uttarpradesh, Noida, B-159, Sector 63 and D-58, Sector 10 or Visit our online Store at Furnstyl.com. Nine days of navratra signified nine colors Grey, Yellow, red, Light Blue, Orange, Dark red, Royal Blue, Purple and the last one is Green so, Let's make these nine days a bit more special by decorating the furniture units in a colorful way. Furnstyl wishes you a very happy and cheerful Navratra.